KRF II - Are you ready? Re: KRF II - Are you ready? So are were all goinga hang out,I really dont know what else to do at the festival besides take pics and video. "See ladies,what happens in Vegas,stays in...KITT"
"Fate rarely calls upon us at a moment of our choosing"
Slade wrote: So are were all goinga hang out,I really dont know what else to do at the festival besides take pics and video. I'm in the same boat. I'll be bringing my kids though so we probably won't be able to stay all day. KNIGHT RIDER RELOADED is a series of movies on Youtube to represent a different creative avenue to the Knight Rider we knew in 2008-09. I am in the process of setting up quantities and the webstore to handle KRF II merchandise. I have decided that for the t-shirts, I'm going to give first shot to the pre-order crowd who will pick up their merchandise at Knight Rider Festival II and then I will later offer whatever I have left to the online orders which will ship to non-attendees. Please note USPS flat rate shipping prices will apply to non-attendee orders. I will try to make sure there's no confusion about the different pricing options when they become availible. I will also announce the event pick-up times so you know when, where to meet, and what to bring to retrieve your merchandise. There will be specific terms and conditions for pre-orders so please make sure you are aware of them. Pre-orders will have a specific cut off date which will be announced later so as to make sure to have enough supply to meet demand. If you try to place a pre-order past the cutoff date, I cannot guarantee you will receive your stuff. Unclaimed pre-order merchandise at KRFII will not be shipped. If a pre-order is unclaimed, I will issue a full refund a week after the event. So please make sure you remember to pick up your items. KRF II LE Posters will be offered to both attendees and non-attendees. Posters that are ordered online for shipment will be shipped seperately from any other items since they require their own special tube with limited space. These posters are limited to 200 prints and to save time are hand signed by me, the artist. I recently received a laser proof of the poster the other day and it is just amazing and that's just the laser proof printed on gloss paper with a gold swatch (representing the gold ink) attached to it. I have been assured the offset final with the gold ink will be stunning! As I don't want to post up the poster in its unfinished form (and give the wrong impression of the final print), I will post up pics when I have the final product in hand at the end of the month. In the meantime I will have a placeholder image of the poster for visual aid in the store. Our friendly neighborhood podcaster, Gene should be getting me photos of the actual finished event t-shirt sample soon. I am quite anxious as you are to see how it turned out! I will not have the t-shirts in hand until the end of the month as well. I will make another post when things are just about ready to launch with descriptions of what's availible, how many of each and terms and conditions. I want to give everyone a fair shot and make sure to avoid as much confusion as possible. I am excited to be a part of Knight Rider Festival II and to help Paul out with offering event merchandise to the fans who desire it while raising money for charity. With all that out of the way just remember to pick up your stuff first and go have some fun! Knight Rider Festival II is going to be amazing this year and you never know what surprises await you or who you'll run into! Stay tuned for more info and store announcements coming this weekend. Absolutely can't wait, Nick! I'll be preordering for sure! To read my fanfictions, go to fanfiction.net and search for my screen name, Rainack. can you buy them at the festival? Lady: "I bet you're tall, dark, and handsome." KITT: "I'm definitely dark and handsome, I'm only tall when I'm climbing a steep incline." I will have very limited and I mean VERY limited merchandise to sell on Fremont Street itself due to permit and tax concerns. I am very limited on what I can actually sell on hand at the event in general, which is why I am offering the pre-order system. Your best bet of securing merchandise is to pay ahead of time through the store and pick up your items at the event. This way I don't have to deal with large crowds exchanging a substantial amount of money on the street. I have more leeway on books but with shirts and posters I can't push it. Slade I'll send you a PM but the store is going to operate on a Paypal payment system as I find it the most reliable. store up yet? will you post linkage? First off, Happy Valentines Day! I had really planned on getting the store launched this weekend and if it were up to me it would have been done by now but due to some delays on the part of my father needing the computer for the weekend to do taxes and other things, I have been unable to work on it. I plan to have the store completed and ready to launch by early this week as soon as possible. With the days slipping by, time is of the essence. Sorry for the delay but I'm closer to getting things in order with each passing day. The store WILL be up and launched by early this week one way or the other. I will make sure the usual forums and social networks are aware when it launches. Here is a sneak peek of the t-shirt prototype so far. Gene and I are still in the process of adjusting the colors though with the printers (and this shot is darker than it should be) so I don't want you to think this is the completed shirt just yet. This is only a glimpse of a work in progress to review quality of the image at this stage. Should be getting some more updates for you by this Monday. and david is asking his fans where to go next.. i started a discussion group for him to come to the festival.. please support me and reply to it! I am pleased to announce that after quite a bit of work today, the KRF II Online Store is ready to launch in the morning. All pre-order products will be activated at that time and payment will be accepted through a Paypal cart system. Please make sure you review the Terms and Conditions page so you are fully aware of what is expected especially with Pre-Order Pick Up. Remember supplies are limited to a first come, first served basis especially on the rare event t-shirt. ALL PRE-ORDER MERCHANDISE MUST BE PICKED UP IN PERSON AT KNIGHT RIDER FESTIVAL II. ALL UNCLAIMED PRE-ORDERS WILL BE ISSUED A REFUND A WEEK AFTER THE CLOSE OF THE EVENT. PRE-ORDER MERCHANDISE WILL NOT BE SHIPPED. All images are placeholder graphics for the actual products. I will add finished product images when I have the finalized merchandise in hand. Partial proceeds from sales will be donated to The Children's Miracle Network. Good luck and see you in Vegas! The Knight Rider Festival store is now open for business. Remember I cannot ship the posters until I have them on hand which most likely is going to be the first week of March. I will post the final merchandise images when I have them to share. I hope you have your hotel rooms in order. If not make sure you have your hotel room booked because rooms are flying fast at all the hotels, especially with St. Patrick's Day just before Knight Rider Festival II. If you did not book under the KRF special rate at the GN you will need to pay an additional $25.00 (if you haven't already) to get into the VIP party. Rainack wrote: Just placed my preorder! Just a friendly reminder, 3 more weeks until pre-orders close. Those three weeks will be gone before you know it so please make sure to get your orders in! I have some great news for you tonight! The Knight Rider Festival II LE posters arrived today! Here are some photos I took of the final product both in and out of the box. Keep in mind that this poster is 16x24 and on gloss paper so I did my best to take the best shots with as little lens distortion and glare as possible. The white spots in the photos are just glare from the flash. I tried to capture the shiny look of the special gold ink in the scroll work and LE letters but I can tell you these photos don't do it justice compared to seeing it in person! I am very pleased with how these posters turned out and I'm sure you will be too! I will post just a couple pics here on KRO and post up a link to my photo album on facebook so you can check out the rest of the shots. Remember these are limited to only 200 signed prints. Here is a link to my photo album for more photos. Remember you can order a poster either for pick up at the event via pre-order or mail order at the official store website! AWESOME! So glad I ordered one! Rainack wrote: AWESOME! So glad I ordered one! Also the cruise with Kitt is Saturday Night right,were we all drive down the strip . that's what it looks like.. last year it was after the VIP party on friday. 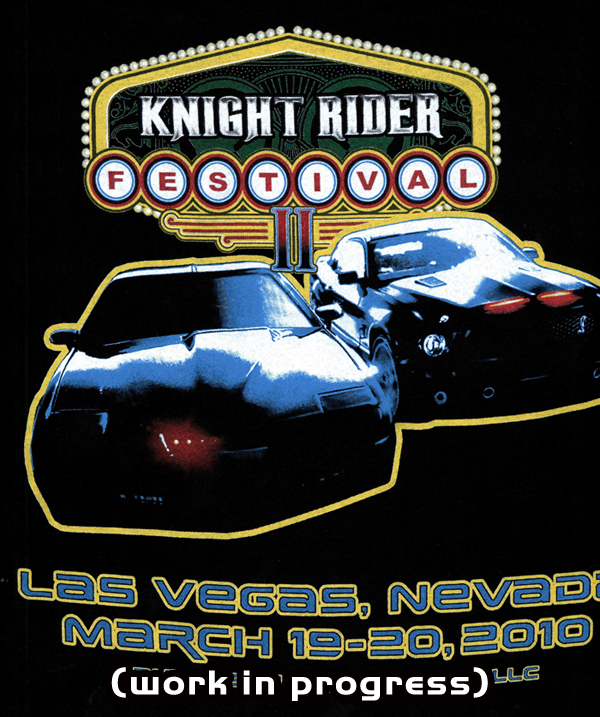 Knight Rider Festival II event t-shirts arriving at some point today. Stay tuned soon for pics! It pleases me to show you the final event t-shirts in real time photos. I really can't express how impressive and vibrant these shirts are in person. The detail is top notch and although I admit I did have my doubts from sample photos, Gene (hudziva) and his people did a fantastic job! Let's hear it for our friendly neighborhood podcaster! Remember this coming Sunday will mark only 2 weeks left to get your pre-orders in for pick-up at Knight Rider Festival II. Then I will offer whatever shirts that are not reserved to non-attendees via mail orders on the store website. Don't miss out! These shirts will go fast and when they're gone, they're gone! Victor Kros wrote: It pleases me to show you the final event t-shirts in real time photos. I really can't express how impressive and vibrant these shirts are in person. The detail is top notch and although I admit I did have my doubts from sample photos, Gene (hudziva) and his people did a fantastic job! Let's hear it for our friendly neighborhood podcaster! Are you still planning to take some posters and shirts to the festival to sell on the day?